First Alert’s Onelink smoke detector sends updates to your iPhone and has a 10-year battery built in. Apple’s smart home platform keeps growing with the arrival of the first HomeKit-enabled smoke detector. 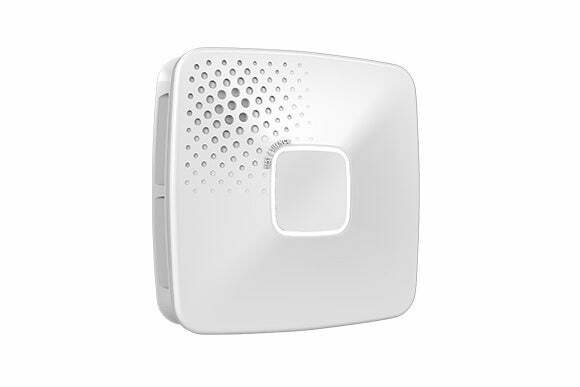 The Onelink smoke and CO detector ($110 at Lowe’s) from First Alert connects to iOS devices over Bluetooth or Wi-Fi, letting users test the alarm and get remote notifications, even outside the house. The companion smartphone app can call 911 directly, and uses voice and location to help get occupants to safety. If more than one detector is installed, they can talk to one another and sound alarms in unison. Instead of using replaceable batteries, Onelink’s detector has a battery pack built in. It should last about 10 years, at which point users will need to buy a new detector. (As The Verge notes, safety agencies such as FEMA recommend replacing smoke detectors every 10 years anyway.) Onelink also sells a hardwired version for $120, with a built-in night light and a battery backup. The basic functionality sounds similar to Nest’s Protect smoke detector, except that Nest hasn’t bothered to support Apple’s HomeKit framework. Instead, Nest has been steadily building out its own integrations with other smart home products. For instance, Protect’s motion sensors can help determine whether you’re home or away, adjusting Nest’s Learning Thermostat accordingly. Onelink isn’t touting any nifty integrations like that, but does support some basic HomeKit features. For instance, users can ask Siri to dim the smoke detector’s night light or check on alerts from an iPhone or Apple Watch. Why this matters: While some HomeKit features such as scenes and room-based controls won’t be of much use to a smoke detector, Apple’s emphasis on security could help Onelink stand out. As Forbes reported earlier this year, smart home devices must include complex encryption to earn the HomeKit stamp of approval, to the point that it has delayed the launch of some products. That’s something to consider if you’re skittish about connecting something as critical as a smoke alarm to the Internet.